Relax & Write is an indispensable tool for anyone interested in doing creative work. 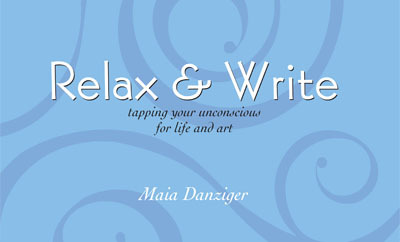 The book (with an accompanying audio CD) distills Maia Danziger's unique method for unlocking the unconscious and using the rich material found there for life and art. For writers - whether you're a novice or a novelist - Relax & Write proves the blank page is nothing to fear. Structured as 12 different journeys, Relax & Write teaches deep relaxation techniques and leads the reader through a series of guided meditation exercises. The process soon forges an infinitely repeatable path, a clear and easily accessible way to get deep writing done. As she skillfully builds your writing into a practice, Danziger also demystifies the process, sharing insights and anecdotes from her experiences and those of her students. Playful, poetic and, most important, practical, Relax & Write empowers writers to awaken the inner voice they've always wanted to hear.